We are proud to announce the launch of one of our recent clients’ websites going live. www.G2anging.com is a major angling website in Canada and their mission is to provide its clients with the most memorable walleye adventure of their life! The site was in design and development for over 3 months. The goal was simple: to create the ultimate angling website and provide an interactive and informative layout to is visitors. To make the web pages as fresh as possible it will be ‘news’ and ‘feature’ driven and updated regularly with the latest stories and fish-catching features from G2Anglins’s big name stars Grant McAllister and Gary Hodge. Our fully integrated CMS, has proven to be a new dimension in the client’s internet strategy. This gives our clients complete control over their own website to update when and how they see fit. 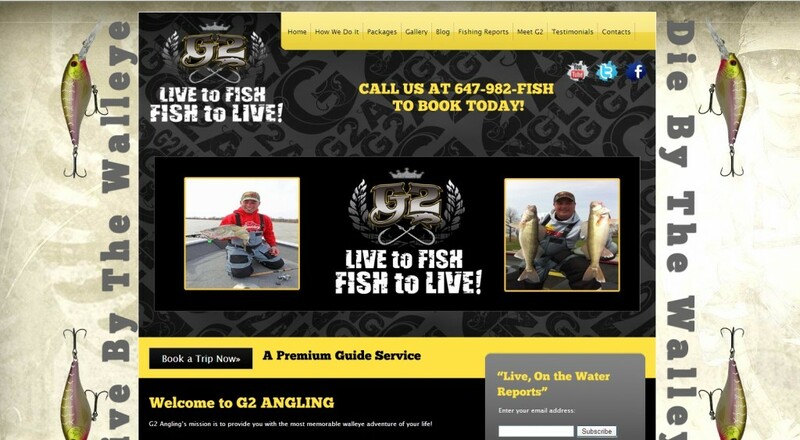 As always we’d like to thank our clients, G2Angling for appointing us to create this website for them. We wish them the best in their future business, and look forward to working with them again with their future online ventures. Stay tuned to get more updates and news from Website Design Toronto.